For months there have been consistent rumours of a concerted air industry fight back over climate change, especially in the UK, where airlines and climate has become the latest environmental battle-ground. A new front group, Flying Matters, has been formed with backing from most of the major airlines. Now, the British Airline Pilots’ Association (Balpa) is hitting out too. 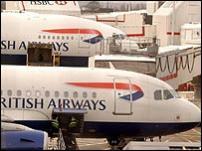 It says “half truths and untruths” have made passengers feel guilty about taking a flight. Air transport is being used as a “scapegoat” for climate change it argues. In its report, Balpa says air travel accounts for only 2-3% of global carbon dioxide emissions. Chairman Mervyn Granshaw said the latest jets were more carbon efficient than the newest high-speed trains on longer journeys. He said the industry would play its part in addressing carbon dioxide emissions and that air travel had become “an easy target”. More like a legitimate target.